The first woman to vote in Tennessee was from West Tennessee and she prized her right to vote. Extensive organizing and hard work preceded her vote. The strategy to achieve woman suffrage was two-fold: work for partial suffrage in the states and press for a federal amendment. Once a state granted the franchise to women, which was usually limited, it made it more likely that the federal legislators would support the 19th Amendment which would grant all women the right to vote. Legislators who resisted supporting the federal suffrage amendment could more easily accept partial suffrage which is what happened in Tennessee. On April 14, 1919, the Tennessee General Assembly passed a limited suffrage act, which permitted women to vote in presidential and municipal elections only. Rep. Joseph Hanover of Memphis argued eloquently and voted for limited suffrage in 1919. He also led the House’s pro-suffrage efforts in 1920. Governor Albert H. Roberts signed the limited suffrage bill into law on April 17, 1919. In 1920, Tennessee was the deciding state in ratifying the 19th Amendment, ensuring women nationwide the right to vote. Unfortunately, Mrs. Hudson died on October 1, 1920, and was unable to vote in the Presidential election. She is buried by her husband in the Camden City Cemetery. While many people do not know about Mrs. Hudson and her contribution to the suffrage movement in Tennessee, the General Assembly has taken steps to ensure that she is not forgotten. In 2008, a House Joint Resolution 886 honoring Mrs. Hudson for being the first woman to vote in Tennessee was passed. "The first woman to ever cast her vote in any political election in Tennessee was Mary Cordelia Hudson, nee Beasley (1851-1920). She voted in the Camden municipal election on Tuesday, April 22, 1919, and reported that she had voted for the winner in the race for mayor, Allie V. Bowles, and for the slate of aldermen that ran with him. Cordelia Hudson was a strong-willed Camden matron, wife, and mother, who firmly espoused the cause for women's rights. She pressed her interest by making sure that she was the first woman in line on that spring day to vote in Camden." 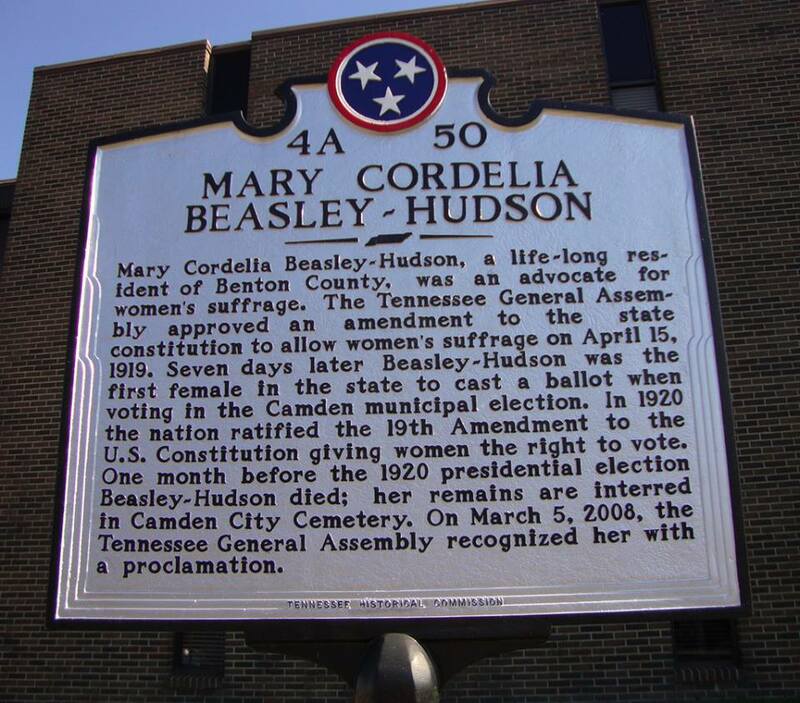 A RESOLUTION to recognize and honor Mary Cordelia Beasley Hudson posthumously on being the first woman to vote in Tennessee. Written by Paula F. Casey. There will be a celebration of “Aunt Cord’s” first vote at the Camden County Courthouse on Monday, April 22, featuring Paula F. Casey and Jacque Hillman, who co-founded the TN Woman Suffrage Heritage Trail – www.tnwomansuffrageheritagetrail.com – as speakers. The festivities begin at 10 am. After the Election – What’s Next?